The Affordable Smart Card that Consolidates your entire Wallet. ** If PayPal is not available, use another site. *The product in above video is different from the actual product sold. Featured on Youtube channel "UNBOX THERAPY"
*Additional charges for international shipment such as import taxes, customs duties and fees must be fulfilled by the recipient. The recipient is the importer of record and must comply with all laws and regulations of the destination country. Orders shipped outside of the Korea may be subject to import taxes, customs duties and fees levied by the destination country. The recipient of an international shipment may be subject to such import taxes, customs duties and fees, which are levied once a shipment reaches the recipient's country. Additional charges for customs clearance must be fulfilled by the recipient; Fuzecard has no control over these charges, nor can Fuzecard predict what they may be. Customs policies vary widely from country to country; you should contact your local customs office for more information. When customs clearance procedures are required, it can cause delays beyond our original delivery estimates. Revolutionary multi-card technology. Hold up to 30 cards in One FuzeCard. Proven to work at retail locations worldwide. Location tracking. Card and finance management. Remote wipe. It may be the same size as any other card in your wallet, but Fuze Card is built for bigger things. 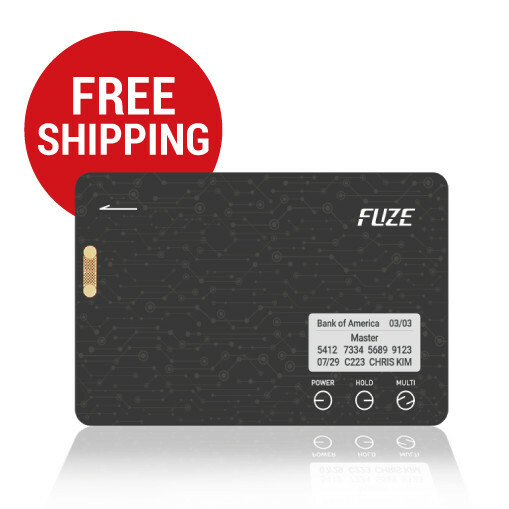 Fuze Card is fully developed and working with ISO and FCC certifications.